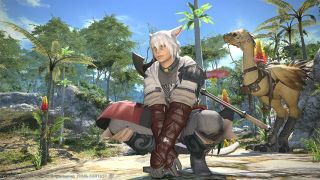 This video features Final Fantasy XIV: A Realm Reborn director Naoki Yoshida and community manager Toshio Murouchi talking about update 3.1, but if you don't speak Japanese and/or you don't have a spare three hours, there's a breakdown on the forums. The update introduce a new chapter of the main story quest, a new side quest line named Saint Endalim Scholasticate and new Vanu Vanu beast tribe quests. There will be two new dungeons, The Saint Mocianne Arboretum and The Pharos Sirius hard mode. The update will add a new 24 man raid set in the Void Ark. The airship voyage system will allow Free Companies to use their crafted airships to explore uncharted islands and fight powerful monsters, and even those who don’t have a free company will be able to use the feature from Ishgard’s Landing. The update will introduce a new weapon upgrade system similar to the Relic weapons. There’ll be new updates to The Manderville Gold Saucer; a new battle mini-game called Lord of Verminion, and new cards will be added for Triple Triad, with new NPCs to challenge. Private housing will get visitor control. Floating mounts will be given the ability to fly. Square Enix has also announced that in October the European servers will be migrated to European data centres. No word on how they're getting on with fixing the Mac port, unfortunately, unless they mentioned it in that video. If you can understand Japanese and fancy spending three hours listening for anything they're not telling us, feel free to let us know.